Looking for an incredible upper-body workout that's social, challenging, and will keep you coming back for more? Look no farther than UREC's Adventure Center, located on the first floor of UREC (turn left after the Welcome Center). JMU has been embracing this new space. Last year, about 5,000 participants used the atrium climbing wall. In one semester with the Adventure Center open, that participation rate has already hit 7,000. And for good reason. Not only is there more space on our 360 degree climbing wall, but the bouldering area spans two full walls, providing much more space and options for the beginning climber. Bouldering is a fantastic way to get into climbing, especially if you aren't quite ready to head 30 feet in the air while learning a new skill. It's more accessible and quite an intense workout. Ropes are not required due to lower height walls and extremely thick padding on the ground. All you will need to do is check in at the Adventure Service Desk, borrow a pair of climbing shoes, and you are ready to go. Adventure staff are available to show you beginner routes, but often other climbers are willing to show you their favorite routes. If you come with a friend, you can take turns trying to make it to the top of the route to let your arm muscles rest. Expect your upper body to be very tired after your first session! 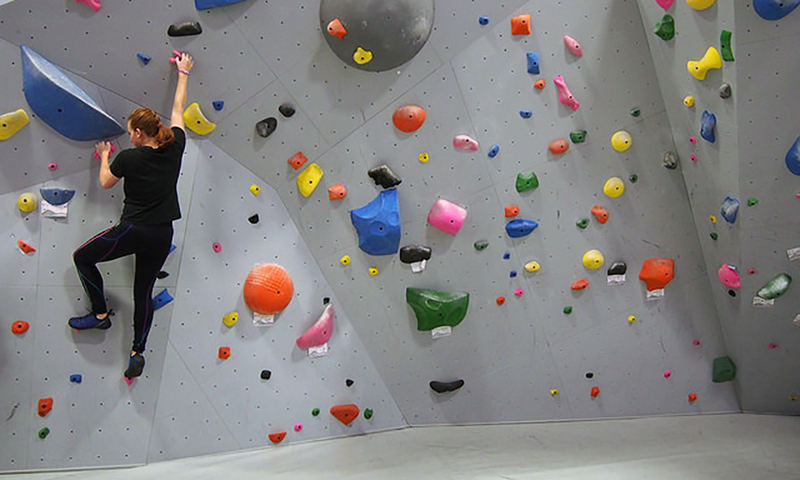 Routes are a combination of holds (what you hold onto) as you go up the wall, and at UREC routes are color coded (ex: pink route or black route). UREC staff change routes continuously at UREC to keep it fresh for regulars. Speaking of regulars, experienced climbers also benefit from bouldering as it is a great way to increase physical strength, gain skills in overcoming challenging holds, and provide mental challenge when overcoming tough placements of holds. So once you get the basics down, this is something you can keep doing for a long time.